GRAND RAPIDS, Mich. – To support military heroes and their families and honor those who lost their lives defending our freedoms, the SpartanNash Foundation is launching its third companywide retail fundraising campaign of 2018, starting June 27. All funds raised during the retail scan campaign will be evenly split between Operation Homefront and Honor and Remember. SpartanNash and its charitable giving arm, the SpartanNash Foundation, invite store guests to join them in supporting our military servicemembers, veterans and their families through the retail scan campaign, which runs June 27-July 8. During the 12-day scan, store guests who visit any participating SpartanNash-owned retail store or fuel center in eight states will have the opportunity to donate $1, $5 or $10 at any checkout lane. Participating stores include Family Fare Supermarkets, D&W Fresh Market, VG’s Grocery, Dan’s Supermarket and Family Fresh Market. Operation Homefront’s mission is to build strong, stable, and secure military families so they can thrive — not simply struggle to get by — in the communities they have worked so hard to protect. For more than 15 years, Operation Homefront has provided critical financial assistance, transitional and permanent housing and family support services to prevent short-term needs from turning into chronic, long-term struggles. Recognized for superior performance by leading independent charity oversight groups, 92 percent of Operation Homefront expenditures go directly to programs that support tens of thousands of military families each year. The mission of Honor and Remember is to create, establish and promote a nationally recognized flag to fly continuously as a visible reminder to all Americans of the lives lost in defense of our national freedoms. The flag is meant to be a public symbol of appreciation that honors all military lives lost while serving since our nation’s inception. Personalized flags are regularly presented to individual families of fallen service members. Each personalized flag contains the name, theater of operation and date of death of the individual. The flags are presented at both private and public occasions. SpartanNash is a national partner and strong supporter of Honor and Remember, underwriting personal flag presentations to families of the fallen and flying the Honor and Remember flag at all company facilities. The flag artwork is also displayed on SpartanNash’s fleet of tractor trailers, which travel more than 67 million miles per year. Past SpartanNash Foundation scan campaign dollars have enabled SpartanNash to be a presenting sponsor of Honor and Remember’s Run for the Fallen – a five-month, 6,000-mile journey to pay tribute to fallen servicemembers. Learn more about this initiative and impactful end-of-day flag ceremonies at honorandremember.org. One hundred percent of donations raised during the 2018 patriotic retail scan campaign will go directly to Operation Homefront and Honor and Remember as they support military heroes, veterans and those who paid the ultimate price. SpartanNash underwrites the cost of the awareness-building and fundraising campaign as well as contributes funding and encourages associates to volunteer with the Foundation’s grant recipients. To learn more about the companywide fundraising effort and the organizations it will support, visit spartannash.com/military-heroes. Since 2016, the SpartanNash Foundation has raised and granted nearly $500,000 for its patriotic partners through its retail scan campaigns, benefitting veterans service organizations including Give an Hour, Fisher House Foundation, Blue Star Mothers of America, Inc., Disabled Veterans National Foundation and Honor and Remember. 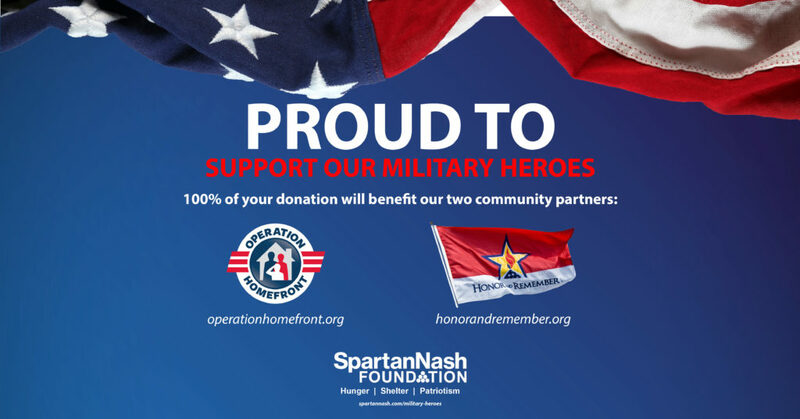 The retail scan campaign supporting Operation Homefront and Honor and Remember is the third of four fundraising campaigns the SpartanNash Foundation will conduct in 2018. To date, the SpartanNash Foundation has raised $463,200 on behalf of local Habitat for Humanity and Special Olympics partners in eight states. The SpartanNash Foundation was formed in 2013 following the merger of the Nash Finch Company and Spartan Stores. It represents the best of the NFC Foundation and the Spartan Stores Foundation. The SpartanNash Foundation is the charitable giving arm of SpartanNash and is focused on providing grants to non-profit community partners who are working to end hunger, provide shelter and support our military heroes. To learn more about the SpartanNash Foundation, visit spartannash.com/foundation. SpartanNash (Nasdaq: SPTN) is a Fortune 400 company whose core businesses include distributing grocery products to independent grocery retailers, national accounts, its corporate-owned retail stores and U.S. military commissaries and exchanges. SpartanNash serves customer locations in all 50 states and the District of Columbia, Europe, Cuba, Puerto Rico, Italy, Bahrain, Djibouti and Egypt. SpartanNash currently operates 142 supermarkets, primarily under the banners of Family Fare Supermarkets, D&W Fresh Market, VG’s Grocery, Dan’s Supermarket and Family Fresh Market. Through its MDV military division, SpartanNash is a leading distributor of grocery products to U.S. military commissaries.